With the new school year quickly approaching (or already here for many of us), I’ve started thinking about the goals I want to accomplish this year. Among them, I want to start wearing heels more often and put more effort into my going-to-class look. One of the ways that I’m going to accomplish these goals is by collecting inspirational photos to display, so I’m constantly surrounded by the fashionable women I want to emulate. A few months ago, Kristina wrote an article about creating a fashion vision board and today I’m going to expand on that, and show you how to make a binder full of fashion ideas as well as a fashion inspiration board! Plus, I’ve included a few extra tips that will keep you inspired for months to come. Do you ever have those days where you have no idea what to wear, but you know that you want to look fabulous? When those brain freezes happen to me, I always pull out my trusty fashion binder, and voila! Instant outfit inspiration! 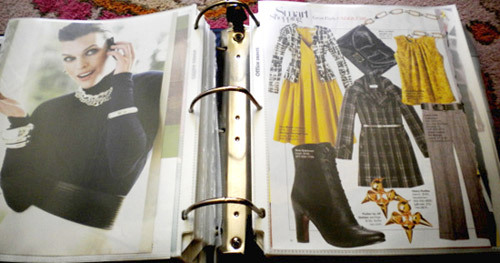 Making a fashion binder is one of the easiest and best things you can do to improve your style. All you need is a binder and lots of clear sleeves to put photos in. I pull out anything from a magazine that catches my eye, even photos where I just like the model’s hair. And then on those days where I feel like everything in my closet is absolutely wrong, I flip through the photos until I find just the right outfit for the day. You don’t need to buy magazines to make one of these, though – you can also do this by printing out fashion photos from the internet and sticking them in the binder! It’s totally customizable and up to you: Who and what inspires you most? Another great way to keep yourself inspired is to surround yourself with photos that get your creative juices flowing. 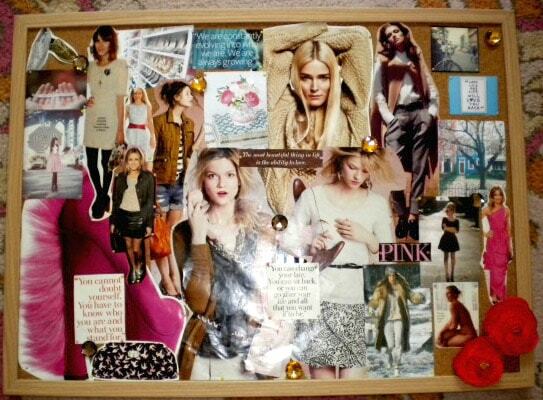 You can do this by making a fashion inspiration board to display in your room! It’s easy to do and as a bonus, it will make a great decoration for your room. Optional: I decided to add flowers to my board to add some dimension to it, but you can add ribbon or anything else you like. Bonus tip: If you’re crafty, paint the frame of your board first to add some more character. Play around with proportions here, and see what looks best where before you pin things down. 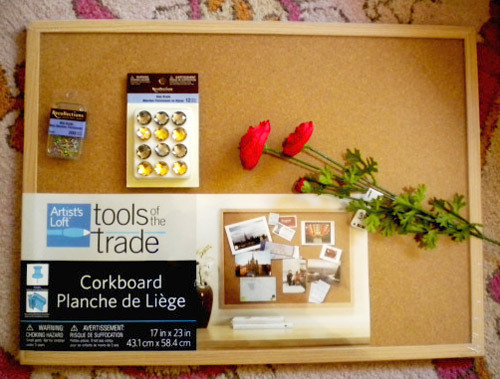 Putting all the photos on the cork board is kind of like a jigsaw puzzle and you have figure out where everything fits. Once you have the layout the way you like it, then it’s time to start pinning things down. To attach the flowers, I pulled the blooms off of the stems, and then used one of the brads to dig a hole in the cork. Make sure that the hole isn’t too big, or the flower won’t stay. Now, proudly hang up the board in your room and let the inspiration start flowing! It’s also a good idea to save fashion inspiration photos on your computer. To do this, you can use Evernote to organize your inspiration like Zephyr does, or just make a special folder for the photos on your computer. If you have an iPhone or any kind of mobile phone that can store pictures on it, you can upload your album of fashion photos to your phone (or get the Evernote app to access your Evernote notebook) and then you’ll always have your inspiration with you. It comes in handy when you’re shopping and can’t quite remember the exact outfit that your favorite fashionista was wearing, or when you’re sitting in class, completely bored, and would rather look at amazing fashion than Spanish architecture from the 1800s… Is anyone else with me here? What do you think about this project? 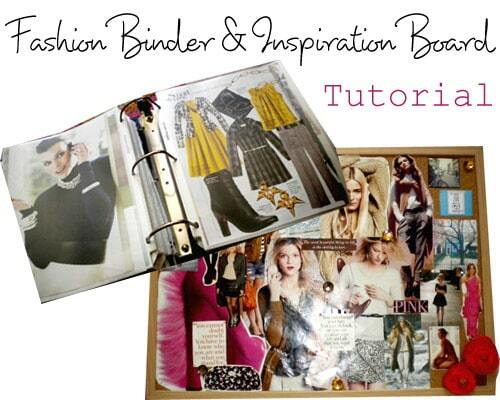 Do you already have a fashion binder or inspiration board? Who or what inspires your style? What are your fashion goals for this school year? Let us know with a comment!